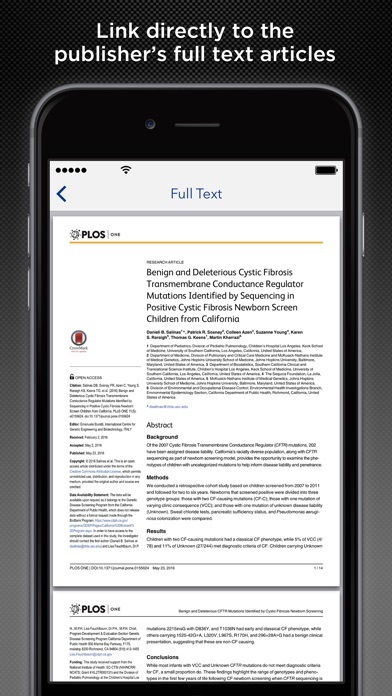 The free Prime app connects you to the most up-to-date journal citations and abstracts from the complete PubMed database. In addition to the ability to perform powerful searches and link to the publisher’s full text articles, Prime also provides a number of exclusive tools not available anywhere else creating a one-of-a-kind user experience. 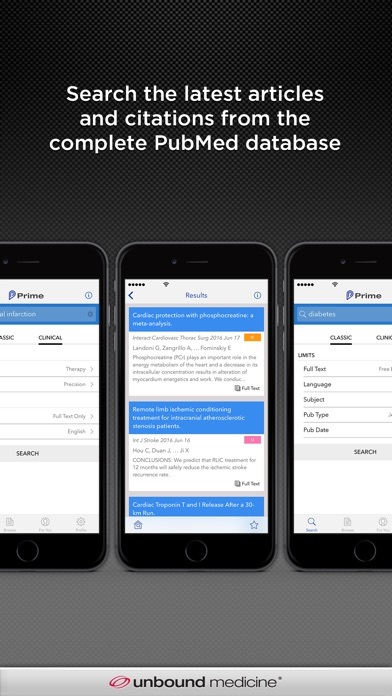 PRIME FEATURES - Search: Perform evidence-based searches by keyword, author, or journal then link to full text articles. - Organize: Bookmark and Tag important articles and searches to quickly return to them later - Share: Share articles directly from the app via Email, Twitter, Facebook, SMS, Dropbox, and more EXCLUSIVE TOOLS - Grapherence®: Unbound’s unique search option allows you to visually explore the influence and interrelationships among journal articles - For You: Discover new articles in a feed designed specifically for you based on how you use the app - Browse: Select specific journals you want to follow and receive alerts when new articles are published WHAT IS GRAPHERENCE? Grapherence® is Unbound’s interactive search that graphically represents the influence and interrelationships among journal articles. Tap the Grapherence button within a citation and instantly see how that article is related to others. Using this exclusive feature the researcher quickly uncovers difficult to find entries, determines overall significance, identifies clusters of thought, and locates seminal articles. 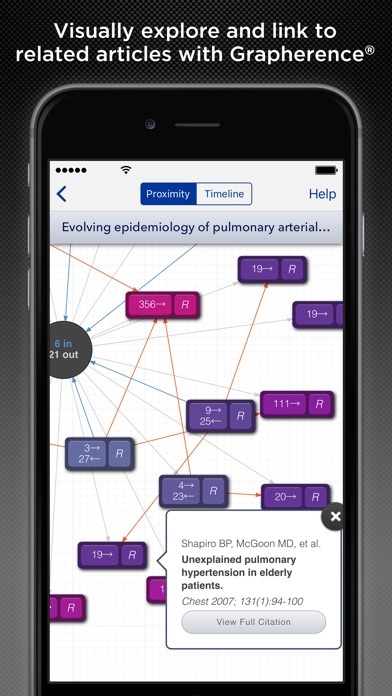 ABOUT UNBOUND MEDICINE With 50+ premium apps available, Unbound Medicine combines powerful software with best-selling content to deliver clinical answers wherever you need them. Top-selling apps include Johns Hopkins Antibiotic (ABX) Guide, Davis’s Drug Guide, 5-Minute Clinical Consult, Harriet Lane Handbook, The Washington Manual, Nursing Central™, and Diagnosaurus DDx. I’m not a doctor, I just enjoy reading the research on topics that affect my health. This app is an amazing source of information. Thank you! 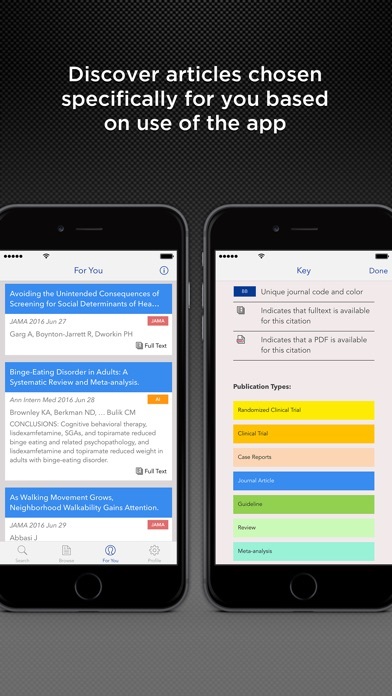 Must have app for each researcher! In a current world of literature overload, this app is blessing. This app keeps me updated on recent articles in the field of my interests. The note taking app helps me recors my ideas for future brainstorming. One change which I would like is a go to favorite option in the app so I can glance through those articles as needed. This is a very helpful app, it’s extremely accurate and it keeps me updated on the most recent papers. It’s fantastic for academic medicine! Cannot save, print nor share articles. This app is good for searching for articles. But it is worse than using Safari since you cannot save, print nor share the articles you found. The information is stuck in this app. You can't save it for reading on a Mac or other device. For this egregious deficiency, this app only deserves 2 stars. It is less useful than searching on medline in Safari. I am absolutely loving this app. It is exactly what I need for keeping updated with publications in my field of interest. I like the push notifications to let me know of new additions to my searches. One improvement I'd make is the ability to delete irrelevant stuff from my lists (perhaps another option when you slide to tag an article). I recommend this to anyone who regularly uses pubmed. Even allows you to log in to academic libraries (if you are registered users) to get full texts. Much better than the readcube app. It is a good app and easy to use. 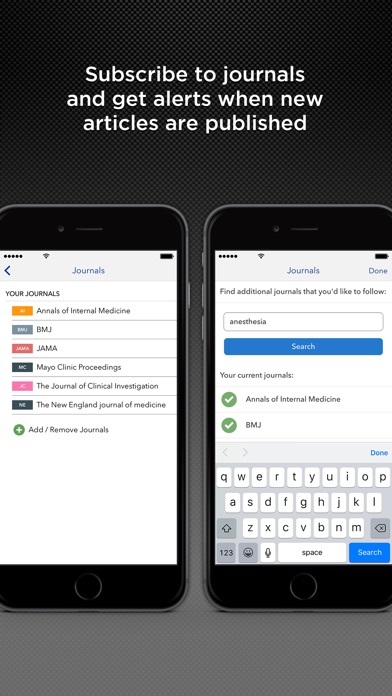 Saving articles and searches can be a little frustrating if you haven't used the app before. It is simplistic and covers a lot of journals, some free and some you have to pay for, just like any other sources. This works very nicely to search and display full text. Price is right, too! This app is not usable. I am running iOS 8.4. Can't use it at all. Crashes immediately on open, despite re-installing. Used to be a 4-5 star app before crashing.